Basics Superstars - 9.07 CHAMPION! And check out the . . .
Who made it to the NCA and NDA American Classic Championship? Lewis University advanced to this special competition. Check back soon for results! New opportunity to compete and you don't even have to leave home! New in the 2001-2002 championship season! We are creating a new opportunity to create with teams from around the country, and you don't even have to leave home or put on your uniform! We're calling in the American Classics Champion and it is offered to both NCA and NDA customers. It is the opportunity for the culmination of winners in each division at all NCA and NDA Classics to vie for the titles of "NCA American Classics Champion"; and "NDA American Classics Champion";, respectively. In May 2002, the winners in each division will be scored again by a new panel of judges via a video recording of the original performance. A single cumulative winner in each division will then be awarded with a team trophy and banner. A huge congrats and welcome goes out to all of our returning cheerleaders and new team-mates! Team meeting on Thursday, May 2nd at 7pm. We will have another tryout at the beginning of the school year for all those interested. Use this summer to brush-up on your cheer skills and we'll see you next semester!! 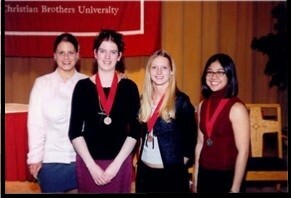 March 21, 2002 Academic Excellence! A huge "Congratulations!" and "Way to go!" for our teammates, sisters, daughters, and friends, STEFANIE LEBRE, JENIFER SCHMIDGALL and TRACY BAYLON ! As a member of the Track Team, Jenifer was awarded last year as well. She continues to compete in both sports and this year Cheerleading is added to her Medallion! For the first time in Lewis University Cheerleading history, THREE cheerleaders will be recognized in the Student Athlete Academic Awards Ceremony on April 9, 2002. History? You ask! Yes...Not because Cheerleaders have never had high GPA's, but because cheerleading has never been recognized in these awards until this year! Keep up the great work and don't ever forget this little bit of LU Cheerleading history you've been honored with, no matter where this big world takes you guys! Brother David Delahanty, FSC, President of Lewis University from June 1982 until October 1987, was a devotee of physical fitness. Brother David encouraged excellence not only in the academic sphere, but also in the athletic arena. Following his untimely death, it was decided that Br. David would prefer a tribute to athletes based on their academic achievements, rather than a black band on their uniforms. Thus, the Br. David Delahanty Student Athlete Awards were established. Medallions are awarded based on the student athlete's cumulative grade point average at the end of the fall semester of that year. The medallion breakdown is as follows: Gold 3.75-4.00 Silver 3.50-3.74 Bronze 3.25-3.49. Outstanding female and male athlete awards are awarded to the graduating senior female and male with the highest cumulative grade point average. March 3, 2002 Cheerleading Champions! 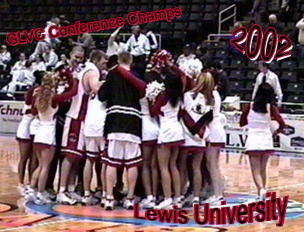 The 2001-02 Lewis University Cheerleaders take home the first of many championship trophies! On March 2, 2002, the team competed at the NCA Windy City Classic at Navy Pier and made Lewis University History. At NCA College National there are many divisions for college cheer teams, however, at "Classics" all colleges are in the Open All-Star Division. Can you imagine the feeling of watching the Coed teams warm up next to us?!. . . . . "well . . . let's just go out there and have FUN!" We had tons of fun, especially when our score of 7.38 was not topped!! We are proof that an all-girl squad can beat the Coed competition. Why are we so excited! If we were going to NCA Nationals this year, how would our team measure up to the competition? Let's take a look! Why aren't are going, you ask? As you may know, this year we made the decision to compete later in the season. We actually learned our routine the week of January 15, 2002 and unfortunately NCA's video entry deadline was January 18th! We would like wish all the squads competing on April 5th the best of luck! It takes an honest, strong, dedicated, determined and hardworking team to stick it out! Bring it home, Illinois sistas! March 3, 2002 Conference Basketball Champions! In Saturdays championship game against Kentucky Wesleyan, the Flyers led the entire game and posted an impressive 77-65 triumph over the nations top-ranked team and defending national champion. Lewis (23-6) earned an automatic regional berth by winning the Great Lakes Valley Conference (GLVC) Tournament. The Lewis University mens basketball team has been awarded the No. 3 seed for the NCAA Division II Great Lakes Regional Tournament and will face No. 6 Hillsdale (Mich.) College in Thursdays first round at the Owensboro Sportscenter in Owensboro, Ky.
Good luck guys! Wish we could be there! !